Online poker has struggled since its return to the United States market in 2013, and over the last 12 months the problems facing Internet card rooms in Nevada, New Jersey, and Delaware persisted. One of the most popular games at land-based casinos, the main hurdle hindering poker online is the lack of sufficient player pools. New Jersey has isolated its interactive gaming environment to only the residents of the Garden State. Nevada and Delaware now share online poker liquidity, but their combined population of less than four million is a far cry Jersey’s nine million citizens. Because tables are often scantily occupied, revenues have perpetually decreased, even as online gambling as a whole continues to prosper. While New Jersey politicians focused their attention on the relentless legal debate with federal authorities regarding sports betting in 2015, the state’s online poker market labored to survive. Revenues stemming from the card game took a drastic hit this year, flopping more than 20 percent compared to 2014. Players continue to step away from the online tables and move to games that don’t rely on participation from others. Albeit meagerly, Internet gambling win overall continued to climb in 2015. If there’s one state that won’t be looking back this holiday season it’s surely New Jersey. By all measures, 2016 will be a very prosperous year for casino operators and online poker thanks to the introduction of PokerStars. Following a long and thorough review by the state’s Division of Gaming Enforcement, the once-called Bad Actor is back. Though the First State entered into an interstate compact with Nevada to share poker players online, the market is still severely lacking. In December of 2013, Delaware residents paid over $106,000 in rake in what was just the market’s second month of legalization. Fast forward to 2015, and monthly iPoker revenues have plummeted south of $30,000. Things got so bad in Nevada that in February of 2015 the state decided to simply stop reporting revenues stemming from online poker. The Silver State is now down to just one room with meaningful traffic, the World Series of Poker network. While it’s impossible to tell how the industry is performing, it’s a relatively safe bet that it closely resembles the struggles of New Jersey and Delaware. That being said, the Nevada online poker market did receive a much needed boost during last summer’s World Series of Poker tournament. For the first time in history, players could multi-table while sitting inside the Rio by playing on mobile devices. According to PokerScout, year-over-year traffic surged nearly 60 percent during the first day of the 2015 festival and was up more some 30 percent for the first two weeks. 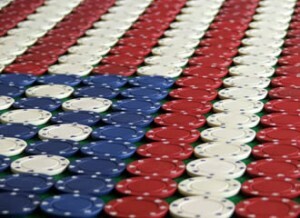 Still less than three-years-old, the online poker market is still in its infancy. So many questions lingered from inception in April 2013 through the end of 2015, but it now appears less and less likely that Congress will impose a federal wide-reaching ban on online gaming and poker. With the world’s largest poker network finally making its triumphant return to the market and vastly populated states like California, Pennsylvania and New York all mulling iPoker bills, 2016 is shaping up to be a year when the industry greatly increases its chip count.